Come join us! More details will be added so keep coming back to check on all the festivities! Click on snapshot for full flyer. Our next TMPC Members Only event is going to be a great one! 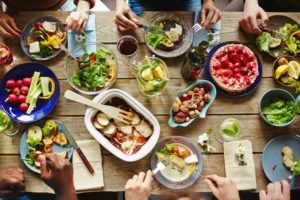 Bring a dish to share! Utensils will be provided. 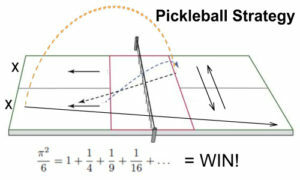 What to bring: A dish to share, your pickleball paddle and your court shoes! Please bring cash and/or a check ….. Because……. 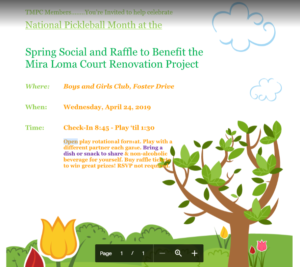 ANNOUNCING FUNDRAISING KICK OFF FOR TWELVE DEDICATED PICKLEBALL COURTS AT MIRA LOMA! Rendering of completed Mira Loma project by TMPC member Architect Sam Updike. Thank you Sam! Drone picture of current conditions at Mira Loma Park by TMPC member Ralph Barbato. Thank you Ralph! 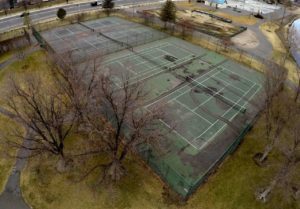 TMPC has signed to work with Truckee Meadows Parks Foundation (TMPF) to start fundraising for court renovation for twelve dedicated pickleball courts at Mira Loma Park. While TMPF will be working to secure larger grants and monies, we can all help start the fundraising process rolling with our April 24th Members Only Social! Let’s get fundraising started with raffles with big ticket items kindly donated by TMPC members and some TMPC merchandise! Big ticket items include a new Onix Summit paddle graciously donated by USAPA District Ambassador for Northern Nevada and Engage rep Nick Sharp. 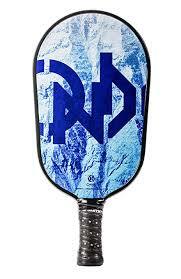 USAPA Reno Ambassador and Pro Lite Rep Nick Barainca graciously donated a Pro Lite paddle. More big ticket raffle items include a Pickleball Basket and a PB Lesson Strategy for Two donated by USAPA District Ambassadors for Northern Nevada Vicki & Nick Sharp. On sale at the event will be car window clings made by Carol Amos in two sizes to proudly display on your car, truck or semi! One for each window? 100% of proceeds will go for Mira Loma Project. Lots of items will be available both for immediate purchase and available through the raffle, so be sure to bring to bring cash and/or checks to dink this fundraiser well beyond the kitchen!